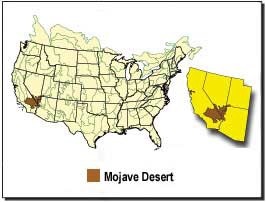 I have been living in the area of Southern California known as the High Desert (which the local calls it but the more accurate term is the Mojave Desert) for the last five years. The high deserts is defined as areas 3,000 feet and higher with an average annual precipitation of less than 10 inches. It tends to be much colder in the winter as low as the teens than the familiar low land deserts but just as hot in the summer. The Mojave Desert hosts about 200 endemic plant species found in neither of the adjacent deserts.Cactus are usually restricted to the coarse soils of bajadas. Mojave Yucca and, at higher elevations Desert Spanish Bayonet, a narrow-leafed yucca, are prominent. Creosote Bush, Shadscale, Big Sagebrush, Bladder-sage, bursages and Blackbush are common shrubs of the Mojave Desert. Now that I’m back here, I have come to love and appreciate the beauty the desert has to offer even more. Since the weather has been good and to alleviate the feeling of cabin fever, I have been taking two to three miles walk every day in the adjacent unincorporated area of San Bernardino county next to my friend’s house. 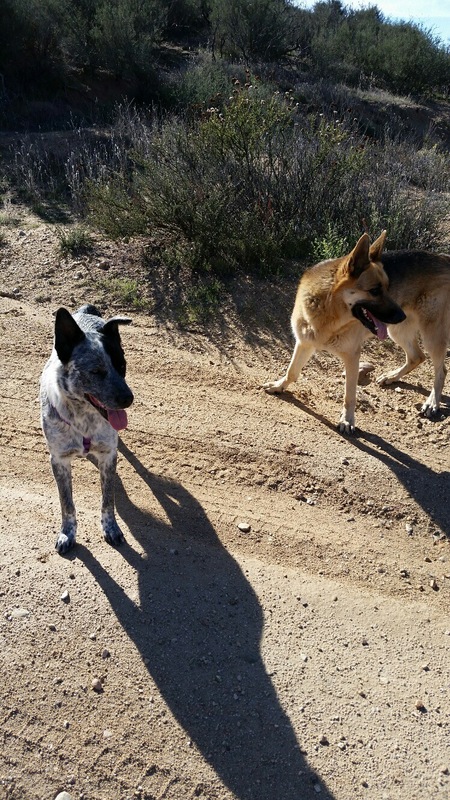 There are so many trails to explore in the area and I have taken my friend’s two dog, Bailey and Willie, along with me to explore different one every day. Since I love following tracks, we have seen various animal and vehicle tracks such as deer, mountain lion, coyote, bobcat, jackrabbits, motorcycle, cars and trucks. One day, we even followed a set of barefoot prints that were the size of a teenager or young adult. The sad reality of the barefoot track led me to a homeless camp which is common to the area since the freeway is only two miles away. 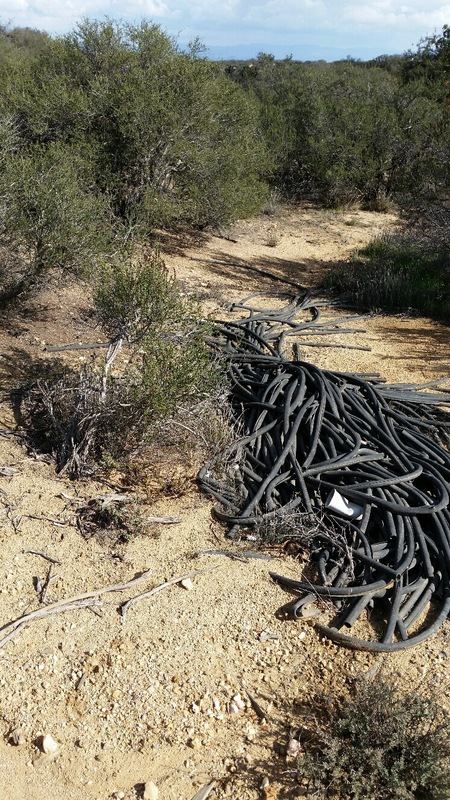 The other sad reality of being close to the freeway is all of the illegal dumping that goes on in the area. I have stumbled upon so many illegal construction materials dump. I even witness two illegal dumpers disposing trash during broad daylight. I tried to take pictures, however one was too far away and the other one I only took picture of the license plate which the Sheriff needed more picture where it show the person and the vehicle as well. Maybe I will get lucky next time. I’m not a “greenie” but I do believe in respecting the use of the public lands for recreational use. I have been taught and have pass on the tradition to my children as well, that we leave the area cleaner than we found it. We have alway brought extra trash bags with us so we can pick up the trash along the way. However, it may not be enough anymore. More and more area are being closed for recreational use. Some “greenie” blames it on the off road vehicle users (OHV) and others blames it on the homeless people. From what I have seen, I believe it is a combination of the OHV, homeless and the non-local residents are the ones that causing the problem. So, how do we solve the problem? The “greenie” philosophy is to close the area to OHV uses which I disagree since we pay taxes and entrance fees for the use of those area. 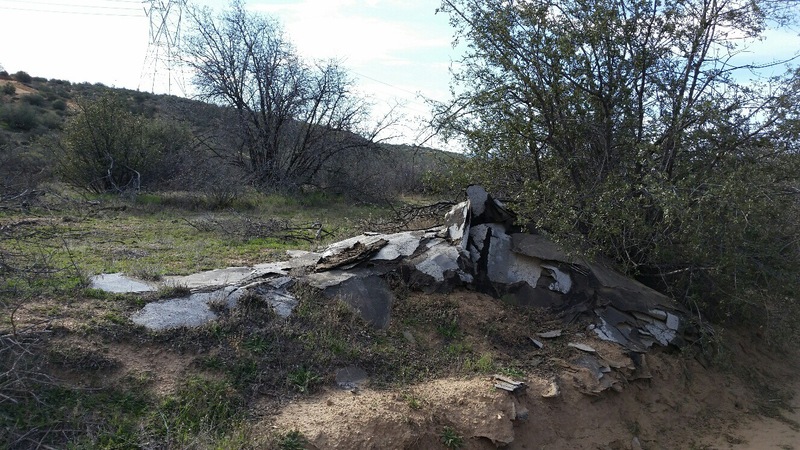 OHV groups have offered “clean up days” which helps but does not solve the problem. In my personal opinion, we need to take back the concept of “responsibility” for our action. If we don’t then more and more public land will be taken away from us because that will be the only solution to the problem. I’ll be happy to host you anytime you want to come out here! My ex and I used to love riding all the OHV trails on his ATV and we’d go 30 to 50 miles all day and explore, but those OHV permitted places are getting fewer and fewer each year because of “bad” riders who contribute to erosion (making deep ruts in wet soil for example) and riding off permitted trails where vegetation is important. I used to joke that the Forest Service should allow anyone over 60 years old to ride their ATV cause us old folks can’t hike anymore. It’s a huge shame that permissible OHV/ATV trails are disappearing fast. In fact, I now ride an electric-bike which is permitted just about everywhere. This is why I ride a dual sport bike because a lot of places are not allowing red or green sticker bikes anymore. I’m not a “greenie” either but illegal dumping really angers me, the incredibly inconsiderateness of the swine who do this. I understand completely why you love this place – it is beautiful. I feel that way about Big Bend – no words to describe it adequately or how it stirs my soul… it just does. I grew up recreating in the deserts of Utah and Nevada and in the mountains of Utah and Wyoming. I love the mountains, but the deserts are the places that really speak to me, that are most like a religion to this irreligious guy. It just rips me up inside when I see that others have abused those special places. I’ve wanted to contribute to a preservation group, to be part of such a cause. Unfortunately, it seems that most such groups–though they might begin with good intentions–end up being pro-prohibition, all about locking up places, about keeping out any and all activity. On the other hand, I don’t trust the states’ rights movements when it comes to land management because they seem interested primarily in privatization and the sale of mineral rights. There seems to be no group to represent the middle interest, the folks that want to use PUBLIC land respectfully and responsibly. 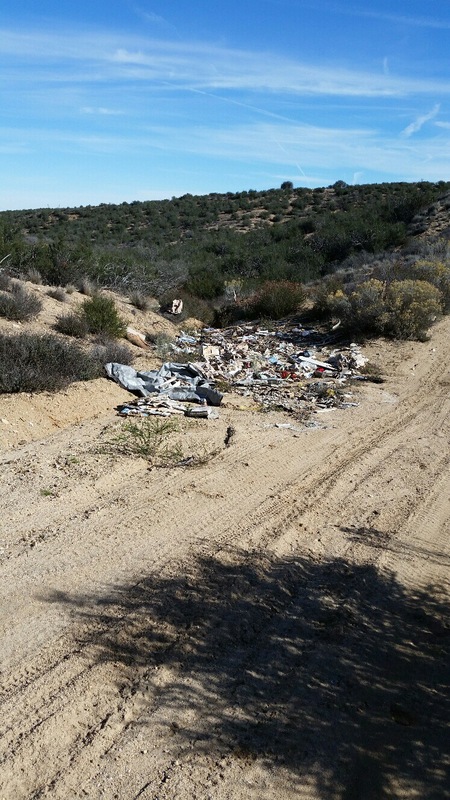 Would seem to me the more hikers, bike and atv riders in an area with cameras would be a better way to control illegal dumping. Catching these scumbags in the act takes eyes in the area. Closing off will only be a safer haven for illegals. You got an excellent point Randall! Like lots of folks here, I love visiting, riding, and driving the roads and trails out there. Also like lots of folks here, illegal dumping really PO’s me – but I also understand why it’s done. Take me, for instance. In the county that I live in, I can dump a ton of regular trash and be charged about $40. If I take a ton of, oh, let’s say broken sheetrock and tile – I’ll be charged around $180 for that “demo load”. A ton of trash is a ton of trash. Why is one more than the other? It’s the economics of the situation, but of course there are also a good percentage of folks that just don’t care, and they’d dump in the local areas even if they could dump for free in the official site. Too damned many people in CA, is what it comes down to. I totally agree with you but they forget that some of us are living in the desert and dumping it in our backyard. That’s what irk me the most.